We have a saying in our house. "Everything is betta with feta!" Well, these Feta Squares are no exception. They are DELICIOUS!!!! Great for all your holiday entertaining. 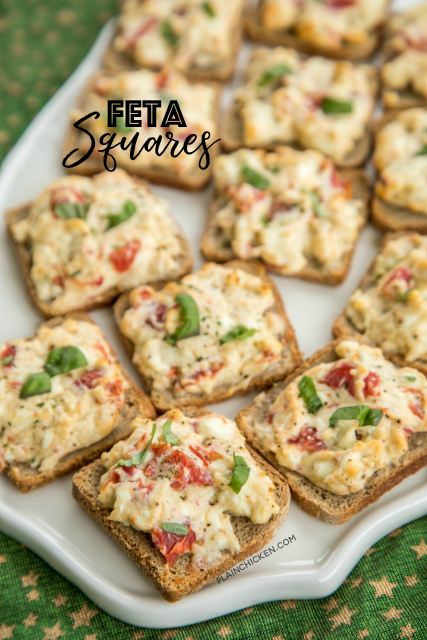 You can make the feta mixture ahead of time and refrigerate it until you are ready to bake the squares. LOVE make ahead recipes at the holidays! I used a loaf of party rye bread. I buy it in the deli section at the grocery store. If you can't find the party rye bread, you can use a loaf of the party pumpernickel bread. Either will work fine in this recipe. I love serving these Feta Squares at holiday parties and tailgates. 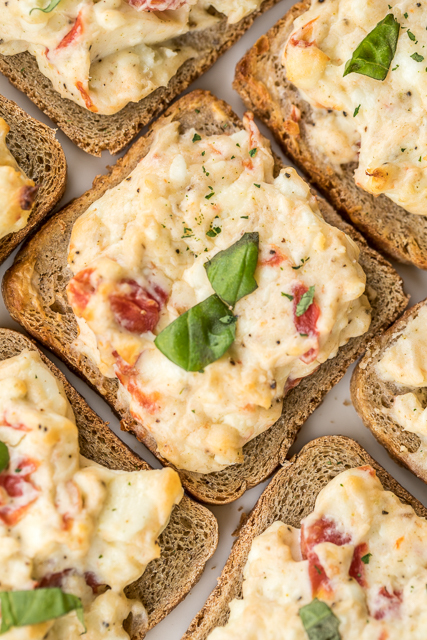 You get about 45 Feta Squares with this recipe - perfect for a crowd! They are easy to make and they taste great hot out of the oven or warmed to room temperature. This recipe uses Greek Seasoning - I always use Cavender's. It is with all the other spices in the grocery store. If you can't find it in the grocery store, Amazon carries it (get it here). 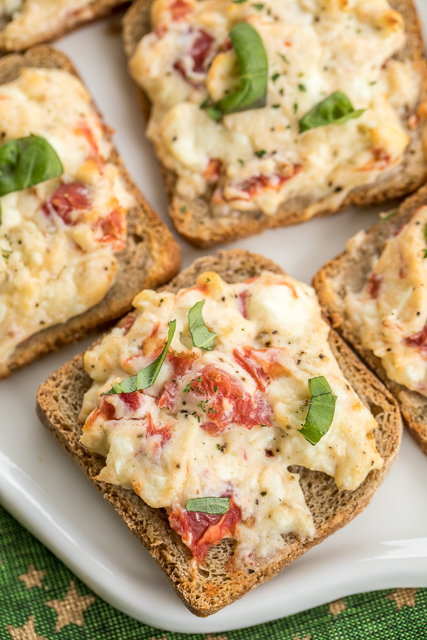 In a bowl, combine feta, cream cheese, greek seasoning, olive oil and diced tomatoes. Spread cheese mixture on top of rye/pumpernickel slices. Place on baking sheet. Bake for 15 minutes. Garnish with chopped fresh basil. I am a greek girl and your recipe is very good, tell you the truth! 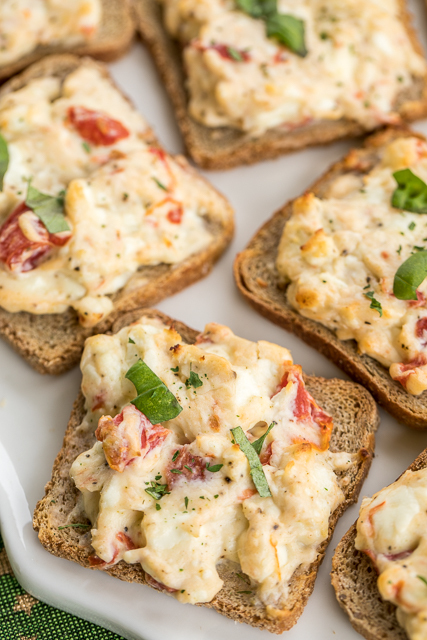 Greek cuisine is full of appetizers for a game night. Woohoo!!! These are perfect for parties! Enjoy! These look so delicious! May I ask, what type of tomatoes did you use? The ones in the photos look sundried almost, but was wondering if smaller is better? 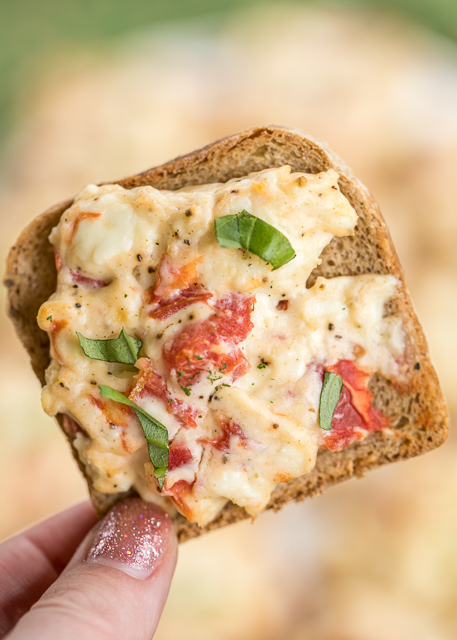 I used 1/2 cup canned diced tomatoes- I hate big chunks, so smaller is always better for me. It is just personal preference. Enjoy! Perfect! Thank you! Can't wait to try it out. You can also use this on "cresent rolls" for a nice cold pizza treat!